Matsuura, T., Aroon, M., Ismail, A. (2012). A Comparison between β-Cyclodextrin and Chitosan as Soft Organic Materials for Surface Modification of MWCNTs. International Journal of Nanoscience and Nanotechnology, 8(2), 71-78. T. Matsuura; M. A. Aroon; A. F. Ismail. "A Comparison between β-Cyclodextrin and Chitosan as Soft Organic Materials for Surface Modification of MWCNTs". 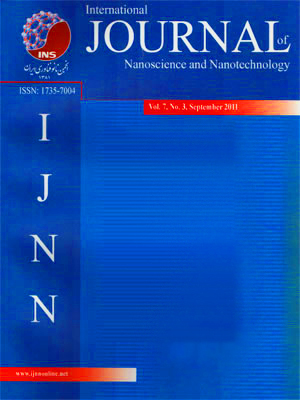 International Journal of Nanoscience and Nanotechnology, 8, 2, 2012, 71-78. Matsuura, T., Aroon, M., Ismail, A. (2012). 'A Comparison between β-Cyclodextrin and Chitosan as Soft Organic Materials for Surface Modification of MWCNTs', International Journal of Nanoscience and Nanotechnology, 8(2), pp. 71-78. Matsuura, T., Aroon, M., Ismail, A. A Comparison between β-Cyclodextrin and Chitosan as Soft Organic Materials for Surface Modification of MWCNTs. International Journal of Nanoscience and Nanotechnology, 2012; 8(2): 71-78. In this paper, synthesized (raw) multi-walled carbon nanotube (rMWCNTs) surfaces were modified with chitosan and β-cyclodextrin using Chen’s soft cutting technique. Raw and surface modified multi-walled carbon nanotubes were observed by transmission electron microscope (TEM). The results showed that chitosan and β-cyclodextrin could attach to the outer surface of nanotubes, wrapping the nanotubes axially. In contrast to the chitosan, β-cyclodextrin not only would attach to the inner and outer surface of the MWCNT walls but also fill their hollow section. It was also found that the surface modified MWCNTs were shorter and their dispersion in organic solvent (NMP) was better than r-MWCNTs. Sedimentation test revealed that dispersion of β-cyclodextrin surface modified MWCNTs was better stabilized in NMP solvent than the chitosan surface modified MWCNTs.